In the 1950s, Chrysler designed the Chrysler TV-8 tank. It was an exciting concept at the time, as it was envisioned as a nuclear-powered tank capable of land and aquatic combat. There was never a mass production of the design. There have been several approaches designed with a theoretical plan to try something different with the standard tank logistics of one crew in the hull and three crew members in the turret. Two common alternatives are “all in the hull except the gun” and “all in the turret” methods. 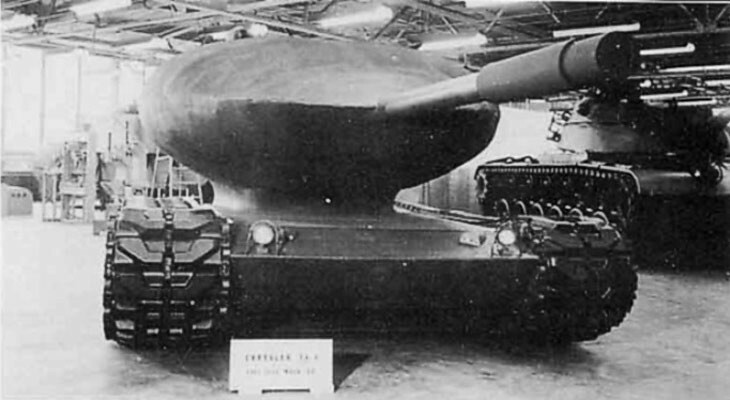 The design of the Chrysler TV-8 is a case in point of “all in the turret.” The design also included the engine being installed in the turret. Some of this reasoning was to increase the chances of the tank surviving against a nuclear blast. This design had a hull-shaped turret that was affixed to a lightweight framework. Positioned in the turret were the engine, as previously mentioned, the ammunition, and the entire crew. The TV-8 weighed approximately 25 tons; the weight was distributed as approximately 10 tons in the chassis and about 15 tons in the turret. The TV-8 was armed with the stationary T208 – 90mm gun that was installed in the turret and it had an auto-loader. Secondary weaponry on the tank included one .50 caliber machine gun operated by the tank commanding officer; it was located on top of the turret and two .30 caliber machine guns on a common axis firing through portals in the turret. The ammunition storage of the TV-8, like both the current and later models of tanks, was in the rear of the turret and was separated from the crew by a steel partition. The stage I design of the Chrysler TV-8 nuclear tank featured a 300 horsepower Chrysler V-8 engine, which was connected to an electric generator situated in the rear turret. The 28-inch wide tracks were each powered by an electric motor in the front section of the hull, and each motor was driven by the electric generator. There were later considerations for other systems to power the tank, which included a vapor-cycle power plant fueled by hydrocarbons, a gas turbine engine drive, and a nuclear-fueled power plant. It should be noted that the layout is basically a turret within the turret. Although the tank can only be operated by the driver and the gunner; it is common to man the tank with a crew of four. The reason for this is because a crew of four can be self-reliant when it comes to repairs for significant maintenance issues, such as a broken track. Otherwise, a crew of only two would have to sit and wait for assistance. The T208 – 90mm gun was flanked by the driver and gunner. The tank commanding officer was in the right rear of the turret with the auto-loader on his left. The driver had a couple of options as he was operating the tank – inside the turret, fully protected or head and shoulders above the roof, fully exposed. The heavily armored inner turret provided protection against a hit from a small nuclear strike, and it was surrounded by a light exterior casing that made the turret look pod-like. Similar to today’s water craft the tank is propelled in the water by a jet pump being operated from the turret. In an affirmation to the not-yet-popular Rocket Propelled Grenades, as opposed to the quite popular HEAT shells fired by cannon, the grenades did show that they didn’t have a high penetrating capability. The turret was supported by an interconnected assembly which revolved in a circle in the hull roof, and it was raised and lowered by two large hydraulic cylinders. 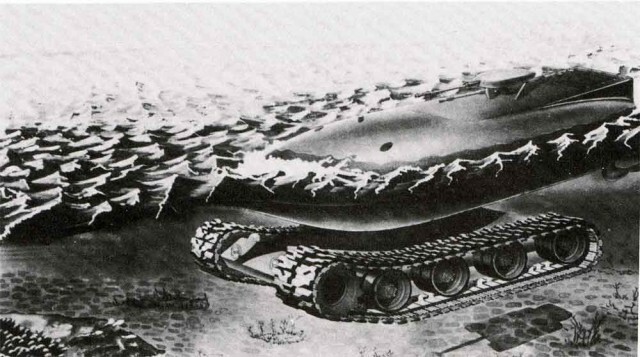 Additional research determined that this design concept provided no real benefits over the current style of tank design, so nothing ever progressed further than the prototype phase.